The plastic gang kit really wants you to make a leader armed with a whip and a bolter/needler. The whip is not really an optimal choice, but the bolter/needler is a heck of a weapon. I did briefly think about clipping the whip off and sticking on a power sword. In the end, the interesting aesthetics won out. 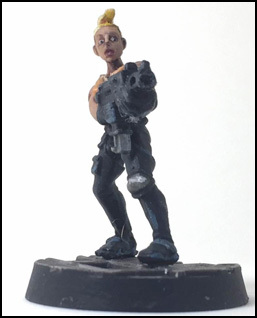 One thing I am looking forward to, if I actually play more then one campaign game of Necromunda is making alternate versions of Modesty with the same head and hair. I like the idea of having multiple unique sets of wargear for what is essentially the same character. I really like how her face came out. So this is my first gang champion, Flair. 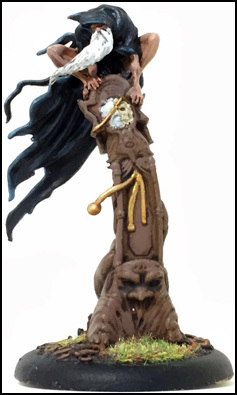 An interesting thing about Flair was she was built during a conversion workshop at Warhammer World. At the last Forge World open day, which was just after Necromunda was released one of the the things you could go and do was build a Necromunda conversion under the tutelage of a couple of the staff there. They had both Escher and Goliath plastic kits available at the time, so I was sure to steal one of the Goliath cigars to give to my Escher. She's also dual wielding plasma pistols, I intended originally for her to look confident and badass - I think given the wide spread of her arms she looks more like she is slightly nervously trying to cover two corridors at once in a zone mortalis mission. The gangs resident psychopath trauma is a little bit of a homage to the original metal Escher who was dual wielding two swords. I went for the face with a bandana over her face to try and reference a surgeon's mask. A healthy dose of blood for the blood god used here, where none is used on any of the other members of the gang. In a slight nod towards tabletop practicality she has a resin laspistol attached to her hip. I think this might have come from a cadian veteran upgrade pack. I decided to use it because being a forge world pistol it is slightly more appropriately scaled then some of the older games workshop plastics which can be very chunky. 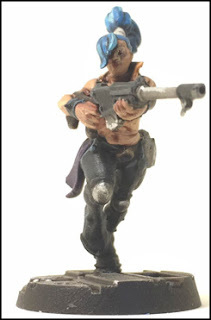 A classic Necromunda model given a new base and a new paint job. 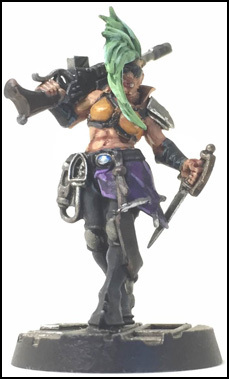 I think the new plastic Escher are fantastic, and I can't really conceive of wanting to use any of my old metals for other members of my gang, but I think forge worlds decision to not produce specific miniatures for juves is a mis-step. I think while the adult metals look comically small and weirdly proportioned next to the excellent plastic gangers, the old metal juves still look great, and I'm glad I have all four metal sculps of Escher juve knocking about. 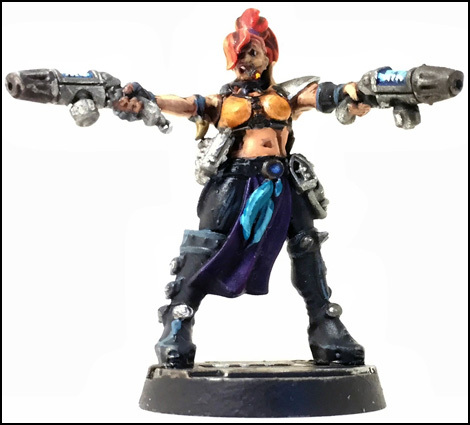 I wonder if Games Workshop has an issue with making models of children with guns in 2018, and that's why we have no Juve models? It wouldn't surprise me to see if the Juve concept evolves into something slightly different as we get the rest of the game. So one of the interesting things about the new Necromunda rules is that it's not only your two heavies who can carry interesting weapons. You can also give a single ganger a special weapon. 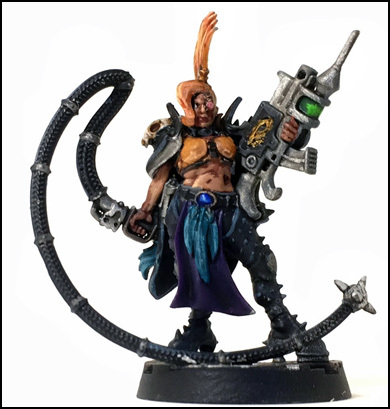 In the case of things like the escher chem thrower (and flamers) it's beneficial to give them to an ordinary ganger because someone with better stats would be wasted on such a weapon. In game terms, I'm not sure I rate the chem thrower. Even in Zone Mortalis games it seems rare that your opponent bunches up sufficiently to let you catch more then one enemy under the template, however, as I was building this gang before the release of the excellent weapon packs I was rather limited in my options for individuality and style, and I do really like the model and am really quite pleased with the effect I managed to get when painting the gas. 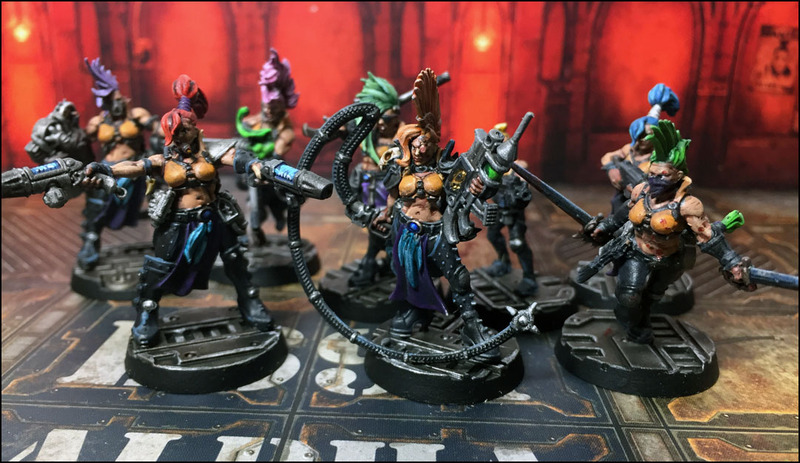 I feel like I should also talk a little bit about the Necromunda game itself. I loved building my Necromunda models, and I am looking forwards to building some more. However there is a bit of a problem here. Necromunda is primarily a campaign game. I'm looking forward to picking up one of the forge world weapon packs, probably this one, and building some models, I also have an idea to do an armoured version of my leader by using some sisters of silence parts. However, unless I am in an active campaign, I probably won't get the opportunity to use all these cool new toys because I have to earn them following the rules of the game. As it stands, my wife and I have played one campaign game of Necromunda, and she finds it very stressful, the notion that her gang can get injured and die. We don't have anyone else to play Necromunda with, and it has become a bit of a losing proposition when we could play something like age of sigmar, or shadespire, or even pokemon cards. (don't ask). So I feel kind of like my Necromunda hobby has stalled before it really got going. Which is a shame, I really like the idea of building and growing a gang, getting cool equipment. New Necromunda is a bit better because I suppose I can build and paint models and then work towards recruiting them, because you are no longer rolling randomly to see what gear you can buy at the end of each game but still. What is also unhelpful, now that the house Escher weapons table has been expanded, and the rules for Toxin have been changed I would probably equip a starting gang fairly differently to the one you see here. Certainly, the champions would be differently equipped. It's a little vexing to keep getting rules changes piecemeal. On one level - I get it. It's like agile software development. It means they can work on things that people want and push regular updates, get feedback, and then push the next update. It's a more modern and responsive way of developing a game. The trouble is, I suppose, that assembling and painting mixtures is a distinctly old fashioned hobby. I have a champion with two power swords, if I was starting over, she would have two toxin swords. 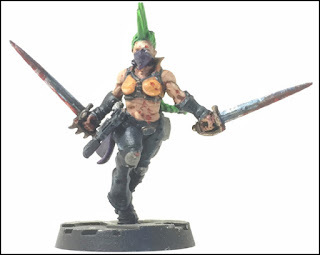 Now, If I want a model with two toxin swords, I either have to ruin the model I have painted, or basically recreate it but with a green caste to the swords rather then a blue one. There are swings and roundabouts. 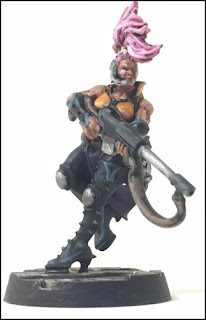 I'm not sure I want to go back to the bad old days of putting out a thick hard backed rulebook with some glaring balance problems and then just having to live with them for years, but on the other hand Necromunda is in a weird place right now. This method worked well for blood bowl, but blood bowl had a robust rulest to fall back on. You could use the existing rules for your team until they got an update - and the update would probably only make a few tweaks. Maybe I'm not suited to a campaign game that requires a lot of friends and a lot of commitment, I don't have 4 or 5 gaming buddies locally to make a campaign really work - but in that case give me a skirmish system that really works and let me play that without feeling like I'm playing half a game. I think Games Workshop realises it wants a slice of the skirmish game pie. It can't have failed to notice that 2000 point games of 40k or Age of Sigmar still take most of a day, and that Skirmish games are really popular. Skirmish games are hard to do though. 40k started life as a skirmish game, but companies need to grow or die so now it is a massed battle game because companies need to keep selling more stuff. 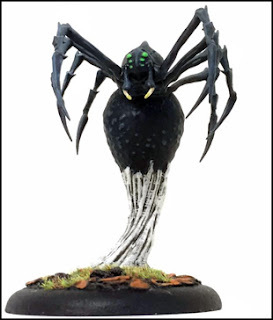 Malifaux has a novel solution to this - you amass a large collection, and then pick a small crew based on the scenario. So you still have reasons to keep buying new releases and expanding your collection, but the game retains it's essential character. With Malifaux though, the models aren't as nice and local stores don't always stock it - so I've kind of dropped out of playing it. 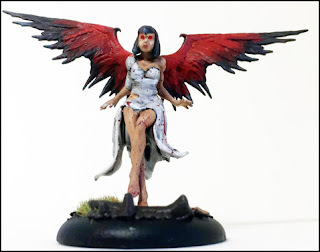 I have had a couple of painted models wating to be photographed for ages, so I'll chuck them up at the end of this post. 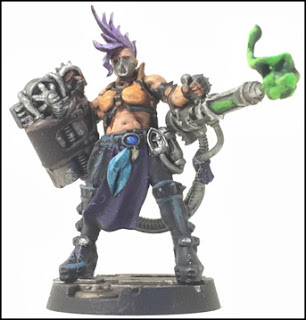 I did assume that Necromunda was planned to morph into a more standard skirmish game, with the non campaign mode of play being expanded over the next few iterations of gang war. However, then Games Workshop goes and teases Kill Team. I suppose it wouldn't be the first time that the citadel studio had ended up competing with the specialist studio, as with shadow war armageddon. I suppose I will show you those random three malifaux models that I have not yet uploaded. Gosh, I painted these so long ago now that I don't really remember much about them. I think I was quite pleased with Alt Titania here at the time, and indeed, she came out much better then regular Titania - but so much less good then the Escher you can see further up the post. It's one of those things. The more you do a thing the better you get at the thing. It seems intuitive, but I guess the issues with miniature painting is that doing the thing badly 'ruins' models. I did at one point start to re-paint my sisters of battle army for example, because they are my favorites, metal is easy to strip and I wanted to rebase them anyway, but now we know plastic sisters are indeed on the way, what exactly is my incentive? Aionus here I think came out fairly well. Notably he is the only Malifaux model to come out in this weird soft rubbery plastic. Painted up really well and with no issues. I think they are using the same rubbery stuff for there "through the breach" massed battle game. Not too sure on that. Bandersnatch - without the elderly miner dude getting eaten. I think I had a reason for doing that, I don't remember what it was. Maybe I had a use for the miner dude. I don't know where in the world it might have gotten to now. My word this post is becoming huge. 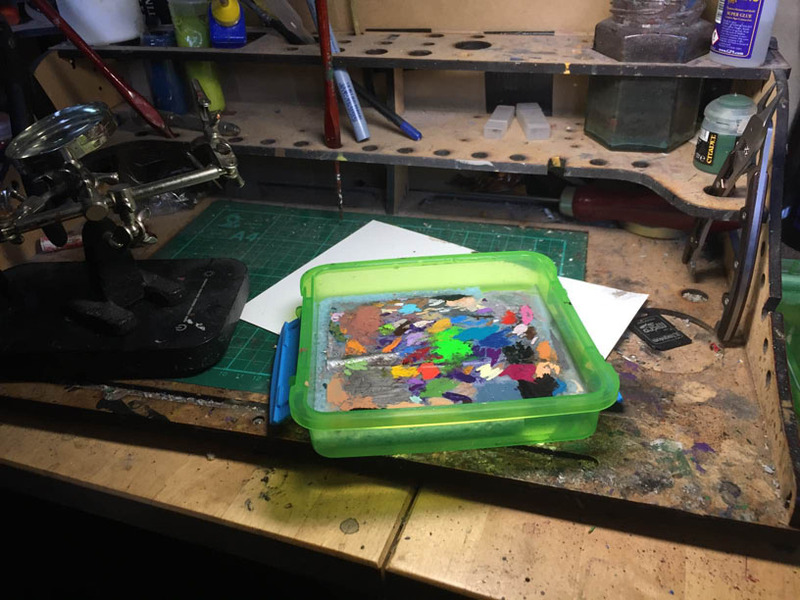 I thought the other day that I should upload all my miniature painting posts to an instagram account, to increase the chances that someone might look at them, (and because like everyone else, I like the dopamine hit from getting likes on social media) - But how do I confine myself to the standard of posting a picture and then like a one sentence "pew pew plasma guns XD" or similar? As should be evidenced from this mammoth post (which should be broken into three or four posts) I enjoy rambling on about stuff. Which just isn't the done thing any more. It's all about short snappy little quips. Even on Facebook (which totally allows me to type out my half baked musings on the subject at hand) it never seems totally popular - and that's among friends. I still might make an instagram. 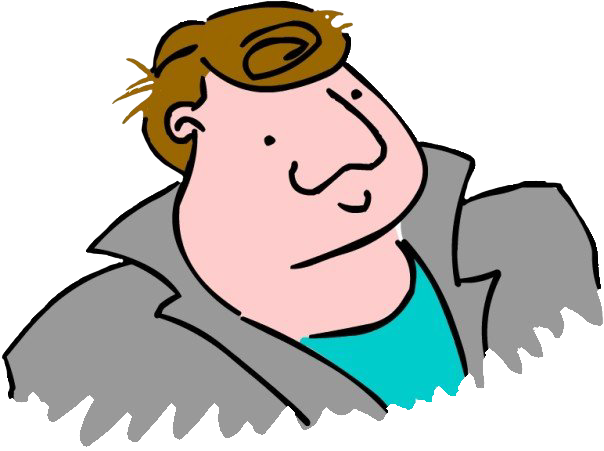 I might not - but this site will continue to be nebulously updated with my painting and stream of consciousness warbling.